Click here to view the 2015 Annual Update in a web-ready format. Recovery of Onondaga Lake is well on its way. With dredging completed, a year ahead of schedule, we are continuing with the capping and the habitat restoration through 2016. More than 110 species of fish, birds, and mammals have already returned to restored wetlands, and nearby areas. The community’s pride and passion have helped fuel this progress and are being rewarded as the lake will be a healthy, sustainable asset for generations to come. Over 500 volunteers have participated in hands-on, experience-based Onondaga Lake Conservation Corps programs that help restore and sustain the lake and its value as an Important Bird Area. As recovery continues, the community is enthusiastic about all of the opportunities to use the lake now and in the future. 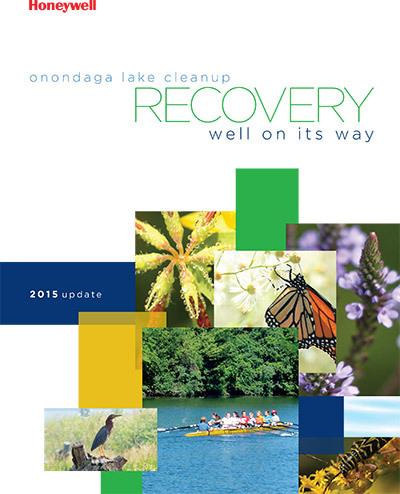 We hope you all will get or stay involved, and learn more about the cleanup by coming to the Onondaga Lake Visitors Center or by becoming a member of the Onondaga Lake Conservation Corps. The Corps is a partnership among Audubon New York, Montezuma Audubon Center, Onondaga Audubon Society, Parsons, O’Brien & Gere, and Honeywell. We are proud of the progress we have achieved and hope you share our excitement as you read our seventh annual update. You can learn more by visiting our website at www.lakecleanup.com.